Masochistic. Yes, that's the word that seems most apropos. 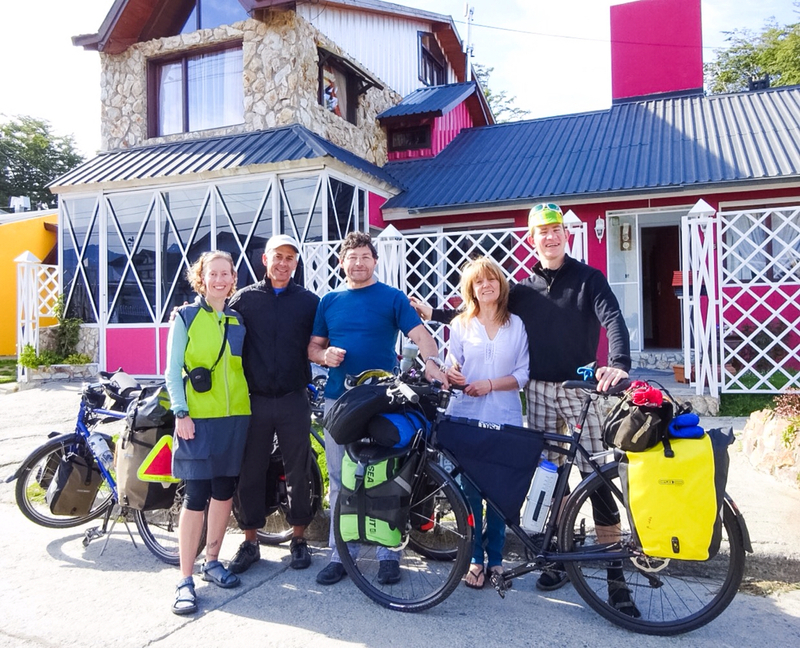 Crossing Tierra del Fuego, we felt like The Three Masochistic Musketeers. It sounds like a Disney movie gone awry. Or perhaps a chocolate candy bar chock-full of razor blades. To be honest, these descriptions are not far from the truth. El Mecánico sets out into the wild blue yonder. Tierra del Fuego ("Land of Fire") received its name when European explorers first came to the island and saw the naked natives huddled around fires to stay warm. We've only seen a few fires while on this island -- namely campfires and stove fires. We firmly believe there are more fitting names than Tierra del Fuego for this inhospitable land. Tierra del Nada ("Land of Nothing") comes to mind, as does Tierra de la Muerte ("Land of Death"). In the morning our AirBnB hosts, Pablo and Neli, saw us off. Me, Tío Ramón, Pablo, Neli, and El Mecánico. We rode the ten or so kilometers before reaching our first checkpoint, just outside of town. How about kicking off this South American bicycle adventure with some introductions! You know me already. I'm Sarah. On this trip, I'll be known as "Saracita," which means sweet, dear, angelic Sarah. Very fitting. I've been wanting to explore outside of the United States by bicycle for quite awhile, and it was time to finally make that happen. Now, some folks will hit up as many cities or countries as they can in their travel time. But that's just not my style. I'd rather spend time knowing one country and its people well. Since I anticipate a good number of years remaining in my life, the plan is to hit up one or two countries a year. This trip will focus on exploring the country and people of Chile. 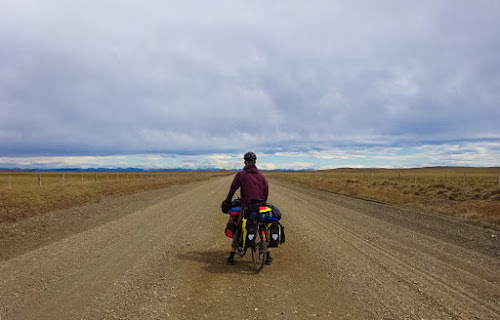 If everything had gone as originally planned, I'd be biking in South America right now. I'd be pedaling through the far northern reaches of Tierra del Fuego, about to enter the pristine wilderness of Patagonia. Instead, I spent this last weekend in the steel jungle that is New York City. My original plans went astray all because of a phone call from Arlen Hall, Tours Director at Adventure Cycling Association. 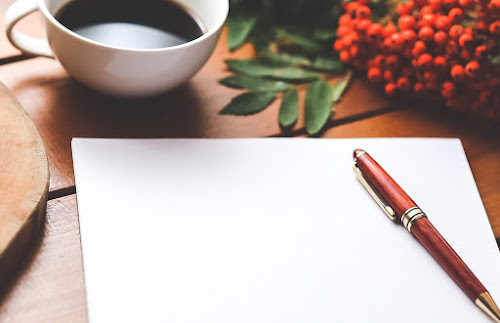 During this call, Arlen asked if I would be interested in helping to represent Adventure Cycling at The New York Times Travel Show the second weekend in January. 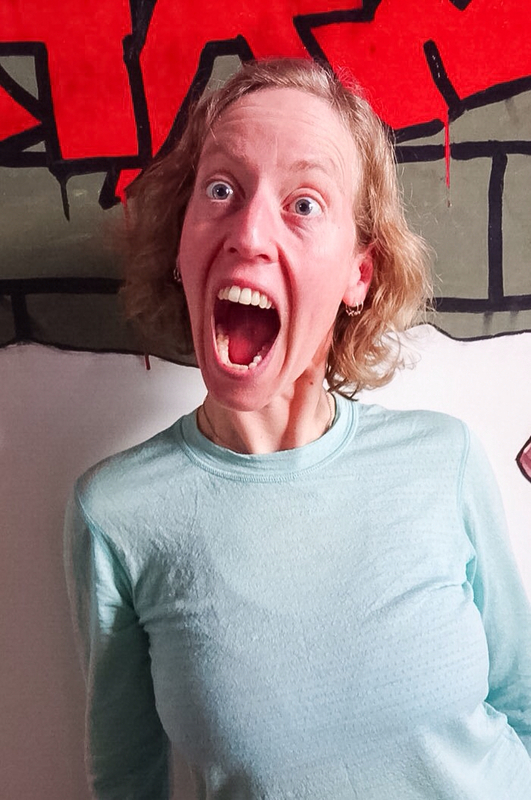 If I didn't already have plans to be cycling in South America in early January, I would have given Arlen an exuberant "YES!" Instead, I hemmed and I hawed. I wanted to help at the Travel Show. But I also really wanted to get my long-awaited South America trip under way. Decisions, decisions, decisions! The grand entrance, welcoming visitors to The New York Times Travel Show. To make my decision, I needed to learn more about The New York Times Travel Show. 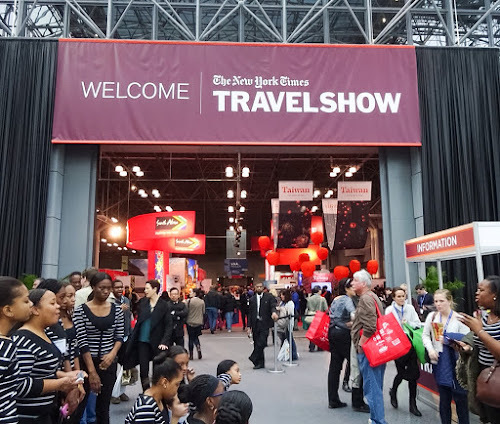 This is what I learned: Held at the Jacob Javits Center in Manhattan, the Travel Show boasts more than 500 exhibitor booths from around the globe, 150 travel industry speakers and events, 100 cultural presentations, and 28,000 travelers and industry professional attendees. 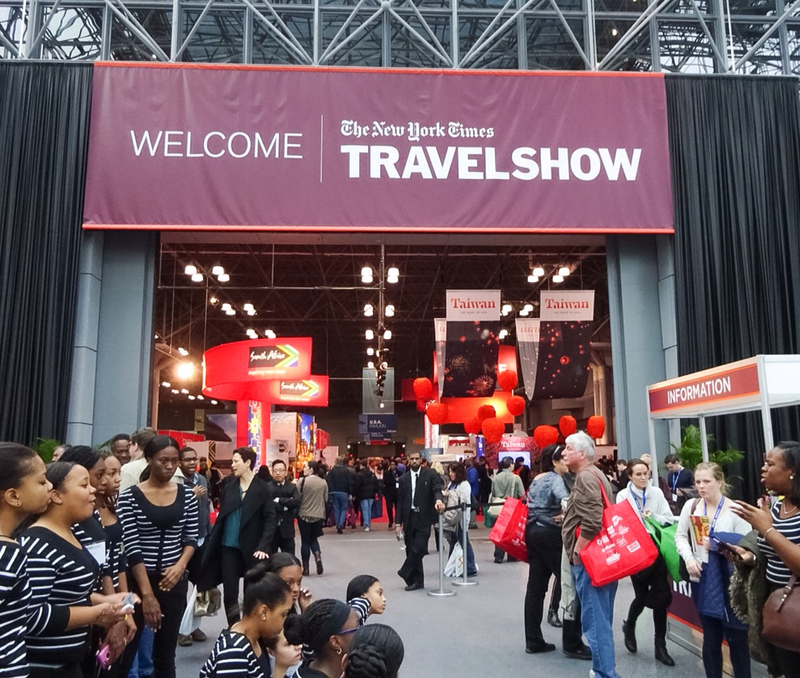 In a nutshell, The New York Times Travel Show is sorta a big deal.